Beat-Bot from "The Hard Reboot"
On Sunday, when the 48 frenetic hours were over, the exhausted teams presented their films to a sold-out crowd at Montpelier’s Pavilion Auditorium. 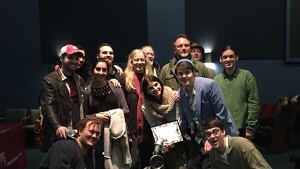 One team went to town with its film reel and produced “The Replacement,” directed by Sequana Skye, in which the slinky celluloid goes rogue and becomes a horror-movie monster — as revenge for its obsolescence, perhaps? The second-place winners made their reel the centerpiece of “Overexposure,” a thriller about a missing boy with a fondness for filmmaking. But the judges — who included this writer — gave the first prize of $1000 to the one-of-a-kind sports comedy from artist-filmmaker Drew Peberdy of White River Junction and his teammates. 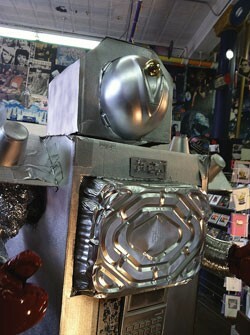 “The Hard Reboot” concerns a tin-foil robot named Beat-Bot that’s supposed to fight but would rather dance the night away. Wouldn’t we all?